Harry Lillis "Bing" Crosby (May 3, 1903 – October 14, 1977) was an American singer and actor whose career lasted from 1926 until his death in 1977. One of the first multi-media stars, Bing Crosby held a nearly unrivaled command of record sales, radio ratings, and motion picture grosses from 1934 to 1954 and the emergence of rock and roll. Crosby's recording of Irving Berlin's "White Christmas" has sold over 100 million copies around the world, with at least 50 million sales as singles. Crosby is also credited as being the major inspiration for most of the male singers that immediately followed him, including such stars as Frank Sinatra, Perry Como, and Dean Martin. Also a very popular film star, Crosby won an Academy Award as Best Actor for his portrayal of a good-natured priest in Going My Way. He made 55 films in which he was top billed and appeared in a total of 79 motion pictures. Crosby also exerted an important influence on the development of the postwar recording industry. In 1947, he invested $50,000 in the Ampex company, which developed the world's first commercial reel-to-reel tape recorder. He became the first performer to prerecord his radio shows and master his commercial recordings on magnetic tape. In 1962, Crosby was the first person to receive the Grammy Lifetime Achievement Award. His is usually considered to be the most electronically recorded human voice in history. Crosby was born in Tacoma, Washington, on May 3, 1903, the fourth of seven children, in a house that his father built. His family moved to Spokane, Washington, in 1906, to find work. His parents were English-American Harry Lowe Crosby (1871-1950), a bookkeeper, and Irish-American Catherine Harrigan (1873-1964), the daughter of a builder from County Mayo in Ireland. Crosby is a descendant, on his father's side, of Edmond Freeman and William Brewster of the Mayflower. The six-year-old Harry Lillis Crosby was a fan of a humorous newspaper column called "The Bingville Bugle." An older neighbor boy shared Crosby's enthusiasm for "The Bugle," and began called Crosby "Bingo from Bingville." The last vowel was later dropped and the name shortened to Bing, which stuck. In 1917, Crosby took a summer job as property boy at Spokane's Auditorium where he witnessed some of the finest acts of the day, including Al Jolson, who spellbound the young Bing. Crosby would later say, "To me, he was the greatest entertainer who ever lived." In the fall of 1920, Bing enrolled in the Jesuit-run Gonzaga College in Spokane, Washington, with the intent to become a lawyer. While in Gonzaga, he sent away for a set of mail order drums. He was soon invited to join a local band, made up of mostly high school students, called the Musicaladers. Crosby made enough money doing this that he decided to drop out of school during his final year to pursue a career in show business. In 1926, while working at Los Angeles Metropolitan Theater, Crosby caught the eye of Paul Whiteman, one of the most famous band leaders of that time. Hired for $150 a week, he and singing partner Al Winker—with whom he had worked since his Spokeane days—made their debut on December 6, 1926, at the Tivoli Theater in Chicago. Crosby and Rinker were a popular duo, but Whiteman added another member to the group, pianist and aspiring songwriter Harry Barris. Whiteman dubbed them The Rhythm Boys and they joined the Whiteman vocal team, working and recording with musicians Bix Beiderbecke, Jack Teagarden, Tommy Dorsey, Jimmy Dorsey, and Eddie Lang, and singers Mildred Bailey and Hoagy Carmichael. 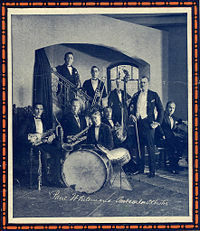 Crosby soon became the star attraction of The Rhythm Boys, and in 1928, had his first number one hit, a jazz-influenced rendition of "Ol' Man River." However, growing dissatisfaction with Whiteman caused him and the other Rhythm Boys to leave the band and join the Gus Arnheim Orchestra. After signing with Brunswick, the other Rhythm Boys were increasingly pushed to the background with the vocal emphasis on Bing. Shortly after this, the members of the band had a falling out and split up, setting the stage for Crosby's solo career. However, fellow member Harry Barris did go on to write many of Crosby’s subsequent hits including "At Your Command," "I Surrender Dear," and "Wrap Your Troubles In Dreams." As the 1930s unfolded, Crosby rose to the top of ranks of American vocal artists. Ten of the top 50 songs for 1931, featured him either solo or with others. He signed long-term deals with Jack Kapp's new record company, Decca, and starred in his first full-length film feature, The Big Broadcast (1932). Around this time, Crosby made his solo debut on radio with The Carl Fenton Orchestra on a popular CBS radio show. By 1936, he had replaced his former boss, Paul Whiteman, as the host of NBC's Kraft Music Hall, a weekly radio program where he would remain for the next ten years. Crosby's biggest musical hit was his recording of Irving Berlin's "White Christmas," which he introduced through a 1941 Christmas-season radio broadcast and the film, Holiday Inn. The recording hit the charts on October 3, 1942, and rose to number one on October 31, where it stayed for 11 weeks. It became a perennial favorite, hitting the top-30 pop charts another 16 times, and even topping the charts again in 1945, and January of 1947. The song remains a holiday classic and the best-selling song of all time. According to the Guinness World Records, Crosby's White Christmas has "sold over 100 million copies around the world, with at least 50 million sales as singles." During World War II, Crosby made numerous live appearances before American troops fighting in the European Theater. He also learned how to pronounce German from written scripts, and read them in propaganda broadcasts intended for the German forces. In a poll of U.S. troops at the close of the war, Crosby was voted the person who did the most for G.I. morale, beating out President Franklin Delano Roosevelt, General Dwight Eisenhower, and Bob Hope. Crosby was not a conventional jazz singer, despite his early association with leading jazz musicians. He benefited from advances in technology that enabled amplification of vocals and he sang with a smooth, conversational ease. He was one of the first singers to exploit the intimacy of the microphone. His love and appreciation of jazz music helped bring the genre to a wider mainstream audience. Crosby also elaborated on an idea of Al Jolson's, one that Frank Sinatra would ultimately extend even further: Phrasing, or more specifically, the art of making a song's lyric "ring true." It is often said that Crosby made his singing and acting "look easy," or as if it were no work at all. His singing came just as naturally to him as talking or breathing. Bing Crosby's sales and chart statistics place him among the most popular and successful musical acts of the twentieth century. Although the Billboard charts operated under a different methodology for the bulk of Crosby's career, his numbers remain astonishing: 2,000 recordings, 383 of those in the top 30, and of those, 41 hit number one. Crosby had separate charting singles in every calendar year between 1931 and 1954; the annual re-release of White Christmas extended that streak to 1957. He had 24 separate popular singles in 1939 alone. Billboard's statistician Joel Whitburn determined Crosby to be America's most successful act of the 1930s, and again in the 1940s. Collection of Crosby records and a video. For 15 years (1934, 1937, 1940, and 1943-1954), Crosby was among the top ten in box office draw, and for five of those years (1944-49) he was the largest in the world. He sang four Academy Award-winning songs—"Sweet Leilani" (1937), "White Christmas" (1942), "Swinging on a Star" (1944), and "In the Cool, Cool, Cool of the Evening" (1951)—and won an acting Oscar for Going My Way (1944). He also collected 23 gold and platinum records in his career, according to Joseph Murrells, author of the book, Million Selling Records. It should be noted that the Recording Industry Association of America did not institute its gold-record certification program until 1958 (by which point Crosby's record sales were barely a blip), so gold records prior to that year were awarded by an artist's record company. Universal Music, current owner of Crosby's Decca catalog, has never requested RIAA certification for any of his hit singles. In 1962, Crosby became the first recipient of the Grammy Lifetime Achievement Award. He has been inducted into the respective halls of fame for both radio and popular music. His overall music sales are estimated at between five-hundred million to nine-hundred million. Bing is a member of that exclusive club of the biggest record sellers that include Frank Sinatra, Elvis Presley, Michael Jackson, and The Beatles. According to ticket sales, Bing Crosby is the third most popular actor of all-time behind Clark Gable and John Wayne. Crosby's most popular film, White Christmas, grossed $30 million in 1954, which when adjusted for inflation equals $233 million in 2004 dollars. Crosby also won an Academy Award as Best Actor for his portrayal of a good-natured priest in Going My Way in 1944. He also starred with Ingrid Bergman in the popular 1945 film, The Bells of St. Mary's, and was critically acclaimed for his performance as an alcoholic entertainer in The Country Girl. Crosby co-starred with comedian Bob Hope in a popular series of movies that became known as the "road films:" The Road to Singapore (1940), The Road to Hong Kong (1962), and five other such films. Their co-star in many of the road movies was actress Dorothy Lamour. Crosby first sang the tune "White Christmas" in the movie Holiday Inn (1942). Crosby made 55 feature films in which he was top billed and appeared in a total of 79 pictures. By the late 1950s, however, Crosby's popularity had peaked. In 1960, Crosby starred in High Time, a collegiate comedy with Fabian and Tuesday Weld that presaged the emerging gap between older Crosby fans and a new generation of films and music. He had a few more moderate successes as an actor, but never recaptured his popularity as a leading man. 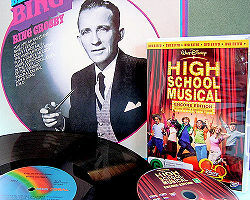 Bing Crosby's desire to pre-record his radio shows, combined with a dissatisfaction with the available aluminum recording disks, was a significant factor in the development of magnetic tape recording and the radio industry's adoption of it. In 1948 he helped to introduce a German recording machine, the Magnetophon, to the U.S. recording industry and also invested $50,000 in the Ampex corporation. In 1948, the second season of his Philco radio show was taped with the new Ampex Model 200 tape recorder using the new Scotch 111 tape from the Minnesota Mining and Manufacturing (3M) company. This innovation helped launch the tape-recorder revolution in America. Crosby was also a fan of Thoroughbred horse racing and bought his first racehorse in 1935. 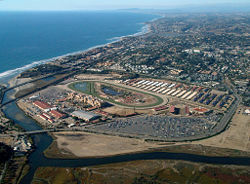 In 1937, he became a founding partner and member of the Board of Directors of the Del Mar Thoroughbred Club that built and operated the Del Mar Racetrack at Del Mar, California. Crosby and Lindsay Howard formed Binglin Stable to race and breed thoroughbred horses at a ranch in Moorpark in Ventura County, California. They also established the Binglin stock farm in Argentina where they raced horses at Hipódromo de Palermo in Palermo, Buenos Aires. The Bing Crosby Breeders' Cup Handicap at Del Mar Racetrack is named in his honor. Crosby also had an strong interest in other sports. From 1946 until the mid-1960s, Crosby was part-owner of the Pittsburgh Pirates. In 1978, he and Bob Hope were voted the Bob Jones Award, the highest honor given by the United States Golf Association in recognition of distinguished sportsmanship in golf. Crosby was married twice, first to actress/nightclub singer Dixie Lee from 1930 until her death from ovarian cancer, brought on by alcoholism, in 1952. They had four sons Gary, Dennis, Phillip, and Lindsay. After Dixie's death, Crosby had relationships with actresses Grace Kelly and Inger Stevens before marrying the much-younger actress Kathryn Grant in 1957, and they had three children together: Harry, Mary (best known for portraying Kristin Shepard, the woman who shot J.R. Ewing on TV's Dallas), and Nathaniel. Crosby's family life, according to two of his sons, differed from the wholesome image Crosby portrayed in films and recordings. In the book Going my Own Way written after Crosby's death, his son Gary detailed years of physical and emotional abuse from his father, including beatings that drew blood. Gary’s youngest brother Lindsay supported the charges, stating, "I hope it clears up a lot of the old lies," although another sibling heatedly disputed the accusations. Phillip Crosby lashed out at his brother for the publication of the book, calling him a "crybaby" while Phillip's twin, Dennis, called the book "Gary's business" and without actually denying Gary's version, explained that "Gary has a lot of anger." 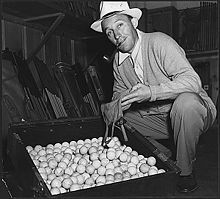 Shortly after 6:00 p.m. on October 14, 1977, Bing Crosby died when he suffered a massive heart attack after a round of 18 holes of golf in Madrid, Spain. He was 74 years old. His last words were reported as, "That was a great game of golf, fellas." He was interred in the Holy Cross Cemetery in Culver City, California. At his death, Crosby was one of Hollywood's then wealthiest residents. He left a clause in his will stating that his sons from his first marriage could not collect their inheritance money until they were 65. Crosby felt that they had already been amply taken care of by a trust fund set up by their mother, Dixie Lee. All four sons continued to collect monies from that fund until their deaths. However, none lived long enough to collect any of their inheritance from their father. Two of them, Lindsay and Dennis, committed suicide. It was widely reported that Lindsay ended his life in 1989, the day after watching his father sing "White Christmas" on television. Dennis took his own life two years later, grieving over his brother's death. Both brothers suffered from alcoholism, failed relationships, and a lackluster career. Phillip Crosby died in 2004; the media reported the causes as "natural" or "unspecified." Bing Crosby was the first multi-media entertainer, leveraging his popular success as a singer into a film career that raised him to iconic status in American popular culture. As a vocalist, Crosby drew loosely from America's eclectic musical traditions to appeal to the broadest cross-section of listeners, becoming arguably the most electronically recorded singer of all time. His lifetime musical output included some 1,700 recordings, 383 of them in the top 30, and 41 reaching number one. His overall music sales are estimated at between 500 million to 900 million. Crosby is credited with being the major inspiration for most of the male singers that followed him, including Frank Sinatra, Perry Como, and Dean Martin. As an entrepreneur, Crosby launched the tape-recorder revolution in America in 1948 when he pioneered the process of pre-recording his shows and financed the early years of the Ampex company. Dunn, Ashley. 1989. Lindsay Crosby Suicide Laid to End of Inheritance Income Los Angeles Times. Retrieved June 6, 2018. Haller, Scot. 1983. The Sad Ballad of Bing and His Boys, People Magazine 19(11): 88-94. Retrieved June 8, 2018. Harris, Roy J. 2009. The Best-Selling Record of All, The Wall Street Journal. Retrieved June 8, 2018. Most Popular Entertainer of the Twentieth Century. This page was last modified on 8 June 2018, at 21:34.